Avril started the "In A World Like This" Tour with the Backstreet Boys on Thursday in Seattle! I haven't been able to find a full setlist yet, but once I know, you will know. Thanks to Avril Bandaids France for the great pictures. USA TOUR STARTS THIS WEEK! Avril will be starting her tour of the USA with the Backstreet Boys on Thursday! Are you going to a show? Don't forget to purchase your VIP Meet and Greet package as well! More info on that here. Avril was snapped by the paparazzi on Sunday frolicking on the beach in Cancun with her brother Matt and entourage. At one point, her bathing suit bottoms almost fell off from an oncoming wave! Luckily, she caught it just in time! Don't we love it when Avril "flaunts" her amazing bikini bod? She is so gorgeous. Avril attended the opening of a new John John store in Sao Paulo on April 29, and another in Rio de Janeiro on May 2. Looking beautiful! Over the last 2 weeks, Avril has been spotted around LA and Brazil. I am going on vacation, so no updates from April 24 - May 9. When I come back, everything I missed will be updated here. Avril will be starting her South American tour on April 29 in Sao Paulo, Brazil. Good luck Avril, and to whoever is attending a show, have fun! 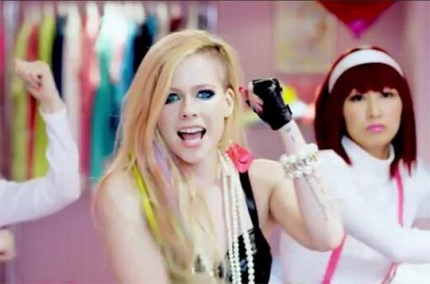 Avril chucks colorful cupcakes, candy and fun at you in her new Japanese themed music video for "Hello Kitty"! What do you think of the video? It's getting a lot of negative feedback, but people need to realize that it's supposed to be FUN, and even though I don't know how those in Japan feel, to me it seems like a relaxed view on the culture, again, with nothing serious about it. You need to watch the video on Avril's official website, as it is currently not available on VEVO or Youtube. "HELLO KITTY" MUSIC VIDEO IN 3 DAYS! Avril is featured in Japan's InRock magazine, the April edition. It shows Avril on set of her "Hello Kitty" music video!